﻿Load Capacity	Up to 8000 lbs. ﻿Load Capacity	Up to 17,000 lbs. • Swivel Load Bearing: Tapered roller thrust bearing having a rated capacity of 17,000 pounds. This bearing has 7" outside diameter and the bearing is shielded as well as protected by a labyrinth forged skirt. • Zerk fitting in swivel section and in recessed head of hollow axle. 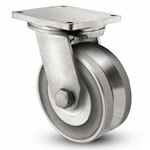 This caster has a ball load swivel (ball load swivel = “BBL”) and is precision machined and heat treated to provide long life with greater capacity for that very rugged application. Made from AISI 1045 forged steel. • Top Plate and Yoke Base: 5/8” thick 1045 AISI drop-forged steel for extended use. ﻿Load Capacity	Up to 15,000 lbs. 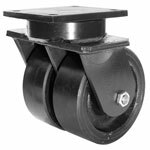 This caster has a precision roller bearing load and thrust swivel section (thrust swivel section = “TRL”) and is precision machined to provide long life with greater capacity for that very rugged application. Made from AISI 1045 drop forged steel. Consult Acorn™ for all Kingpinless Spring Loaded Applications. ﻿Load Capacity	Up 1,000 - 15,000 lbs. • Large 1-1/4" King pin is integrally forged with upper raceway using SAE-1050 quality grade steel. Used with a slotted nut to allow for proper bearing adjustment whenever necessary. Designed to be virtually indestructible! • Flamed Hardened Swivel Raceway: All bearing raceways are flame hardened to extend service life, reduce brinelling from shock loads, and to generally improve swivel performance. • Formed and Welded Fork Legs: Extra-wide 3/8" x 5" side forks with formed reinforcing bubble are continuously welded for added strength. • Locked Wheel Axle: Special 1-1/4" diameter ground steel axle bolt is locked in position with indexing lance in side fork to prevent unwanted movement. ﻿Load Capacity	Up 10,000 lbs. 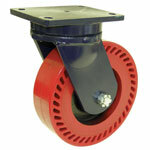 Expertly engineered to be the best single wheel, shock absorbing workstand caster available. Heavy duty Bellville spring suspension allows for safe movement over irregular surfaces providing 3-inches of travel. 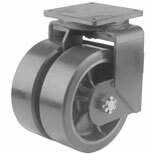 Tapered roller bearings are used both in the swivel raceway and the wheel. All metal parts are expertly machined and hand crafted to exact specifications and close tolerances. ﻿Load Capacity	Up 20,000 lbs. The ultimate answer to suspending extremely heavy loads. Suspension system allows 3-inches of travel (unloaded) to smooth out the way for moving heavy loads commonly found in aviation scaffolding. Tapered roller bearings are used in both wheels and swivel raceway to allow for easy operation and provide long service life. 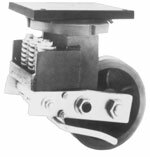 Fabricated with a super heavy-duty three-spring system, this is our premium shock-absorbing caster for extremely heavy loads. Upper raceway top plate and base plate are flame cut from 1" thick steel and precisely machined by CNC lathe to very close tolerances and dimensions. Pressure fitting is supplied in base plate for lubrication. Both upper main load bearing and lower thrust bearing utilize heavy-duty tapered roller bearings for maximum mobility under heavy loads and to withstand lateral forces. Extra-large 1-1/4" king bolt is threaded and securely fastened at both ends to ensure a solid fit. The stud is welded to the top plate to prevent loosening, while the nut is tightened to exact specifications. Standard finish is Laguna Blue. • ﻿﻿﻿﻿﻿﻿﻿﻿Raceway Design: 4-1/2" diameter with 3/4" diameter carbon steel balls. Precision machined and hardened to 53 Rockwell C minimum scale. Load and thrust are accommodated by our patented Kingpinless design. • Sealed raceway is standard. • Axle: 3/4" bolt and nut for 3" wide, 1" or 1-1/4" bolt and nut for 4" wide, 1-1/4" bolt and nut for 5" wide. 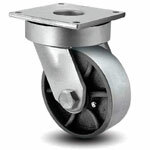 • Wheels: 3" wide wheels are available with either a 1" roller bearing or 3/4" tapered bearings. 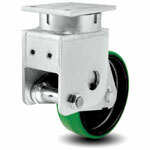 4" and 5" wheels are available with 1-1/4" I.D. roller bearing or 1-1/4" tapered bearings. All wheels are equipped with a lubrication fitting. • Bolt Hole Spacing: 4-1/2" x 6", slotted to 4-1/8" x 6-1/8"
• Mounting Bolt Diameter: 1/2"
﻿Load Capacity	Up to 40,000 lbs. Best solution for demanding applications. Extending service life and reducing all possible causes for caster failure. Typical applications include ground support equipment, die carts, and aircraft engine stands. Made in the U.S.A. Wheels: Wheels are either 3", 4", 5" or 6" wide depending upon wheel size and type. Wheels have either a 3/4", 1", 1-1/4" or 1-1/2" roller bearing or 3/4", 1", 1-1/4" tapered wheel bearings. Roller bearing wheels rotate on a hardened and ground spanner, tapered wheel bearings rotate on the axle. All wheels are equipped with lubrication fittings. Mounting Plate Size: 8-1/2" x 8-1/2" x 1/2"
• Raceway Design: 4-1/2” diameter with 3/4” diameter carbon steel balls. Precision machined and hardened to 53 Rockwell C minimum. Load and thrust are accommodated by our patented design. Sealed raceway is standard. 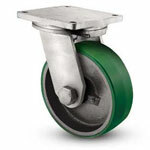 • Wheels: 3” wide wheels are available with either a 1” roller bearing that rotates on 3/4” x 1” x 3-9/16” hardened and ground spanner bushings or 3/4” tapered bearings that rotate on a 3/4” axle. 4” and 5” wheels are available with either a 1-1/4” I.D. roller bearings which rotate on a hardened and ground spanner bushing or 1-1/4” tapered bearings which rotate on the axle. All wheels are equipped with lubrication fitting.